Leaf Greens™ is a nutritious whole food supplement powder that is rich in nutrients to boost your immune system and improve your health. We've talked about the benefits of whole food supplements and how we can use them to get all the nutrition that we are missing from our current diet and lifestyle. 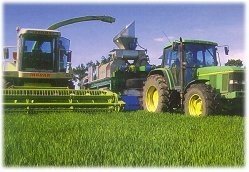 I'm really excited about a new product that AIM has recently developed that is even more potent and beneficial than their best-selling green food Barley Life. This amazing green drink is an all natural juice concentrate that combines the leaves of these five nutrient-dense leaves. Order Leaf Greens at wholesale prices! AIM uses the least invasive, non-chemical process for concentrating the leaf juices. It's actually a new ultra cold filtration process that preserves the proteins, amino acids, and other nutrients naturally found in each of the four leaves included. What the unit does is push water, salt, sugars and some potassium through a thin membrane. This semi-permeable membrane is able to separate substances when pressure is applied across it. The result is highly concentrated leaf juices which are then spray-dried to preserve the live enzymes and amino acids. Each 3 gram serving of this green whole food juice packs quite a punch. It's a great alkalizing drink that helps keep your body from being acidic so that you maintain a proper pH balance. Folic acid, chromium, protein, chlorophyll, vitamin A, amino acids, calcium, manganese, magnesium, flavonoids, and antioxidants, and more. Balanced Amino Acid Profile - enables complete protein assembly in the human body. Lutein - protect the skin and eyes from free radicals and may also prevent macular degeneration. Vitamin K - crucial to healthy bone density, regulates blood sugar, and may help prevent hardening of the arteries. Iron - helps deliver oxygen throughout the body (major component of haemoglobin). Quercetin (flavonoid) - helps reduce the production of uric acid and ease the symptoms of gout; inhibits the production of release of histamine. Great for low-carb, low-fat, and low-sodium diets. Appropriate for vegetarians and those on strict vegan diets. If you've used BarleyLife, you are going to really love Leaf Greans. The test is much more mild and pleasant, but the benefits are even greater. It's a great combination. I really want to hear your results and opinions once you give it a try. Are you convinced? 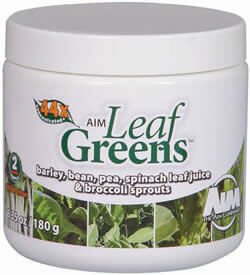 As much as I love Barley Life, I love Leaf Greens whole food supplement powder even more. Place Your Order for LeafGreens and start improving your health and well being! Have A Question or Testimonial About Whole Food Supplements? If you have any questions about whole food supplements feel free to ask them here. You might have an experience of your own to share that will encourage and help others find relief and better health. Please take a couple of minutes to tell us about it.